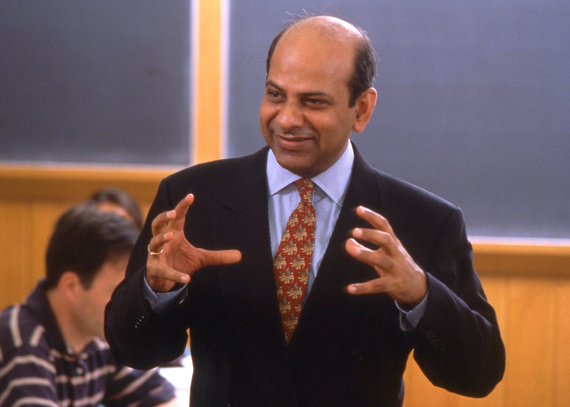 I met Vijay Govindarajan (VG) several years ago when I was an Assistant Director at the Tuck School of Business at Dartmouth College. He is a Wall Street Journal and New York Times bestselling author, widely regarded as one of the world's leading experts on strategy and innovation. As General Electric's (GE) first Professor in Residence and Chief Innovation Consultant, VG worked with Dartmouth alumnus and GE CEO, Jeff Immelt. Together, they wrote "How GE is Disrupting Itself" -- The Harvard Business Review (HBR) article which pioneered the reverse innovation concept, defined as any innovation first adopted in the developing world. VG is rated the #1 Indian Management Thinker in the most current Thinkers 50 rankings. He has also won the prestigious McKinsey Award from HBR twice. At present, he is the Coxe Distinguished Professor at the Tuck School, a new Dartmouth-wide faculty chair. 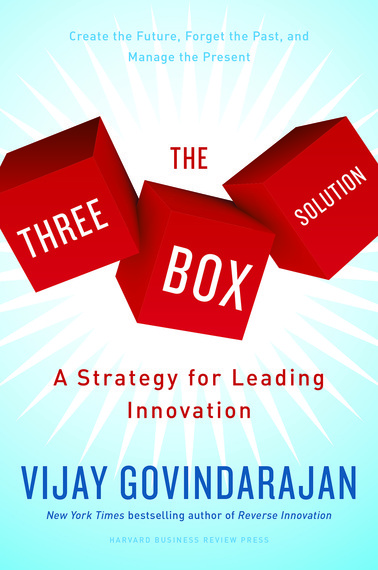 Dartmouth College alumnus, Lancel Joseph '13 and I interviewed VG about his latest book, The Three Box Solution: A Strategy for Leading Innovation, which will launch at the end of April. How can large corporations become / remain nimble for innovation? Once companies become large & successful, the tendency is to preserve success. The tendency is to focus on box 1. Box 1 is about managing the present, box 2 is about selectively forgetting the past, and box 3 is about creating the future. For large companies, success becomes a trap because they tend to focus on box 1/present. Large companies are at an advantage because they have the resources and capabilities to create new business. With the right mindset, they can remain nimble. Being nimble means that they need to set up small teams within the large company - dedicated teams to work on box 3. Dedicated teams should have some separation from box 1 - the performance engine. This allows companies to create a Silicon Valley mindset within the large company body. Which industries face greater obstacles when implementing the Three Box Solution? With the Three Box Solution, an organization has to balance its activities across all 3 boxes. Box 1 is about competition for the present. Boxes 2 and 3 are about competition for future. It's the job of every company to create the future while managing the present. No industry can focus strictly on box 1. All industries have to maintain balance across the three boxes. The game of balance/emphasis on each box varies across industries and is dependent on the dynamics of change in the industry. A "pure" startup has no box 1 or 2. It only has box 3. Very quickly, young companies develop the need for a 3 box balance, because more than anywhere else, the competition is brutal in Silicon Valley. For example: DropBox's box 3 move was a folder that could store data conveniently. In Silicon Valley, once you do something smart, everyone else will try to commoditize your strategy. The empire strikes back. For example: Amazon and Apple have introduced cloud-based storage. Box 3 of Dropbox has become box 1 because of competition. DropBox must come up with the next box 3. Otherwise their valuation will drop. The three box balance is even more important in Silicon Valley, because box 3 today, becomes box 1 tomorrow. Other companies, like GE, usually have a longer time with box 3, but they still cannot ignore it. Amazon is a great example of box 3 balance, because they have expanded their product and services offerings (competing with Walmart in retailing, competing with IBM for data storage, and competing with Apple as a device maker). Companies have to constantly maintain the three box balance in the tech industry. How can companies metamorphosize into lifestyle brands? Best example: Hasbro - Originally a toy company (making Transformers toys), now it has a 360 lifestyle metamorphosis. Customers can experience Transformers as a toy, as a movie, in Universal Studios, as pillowcases/towels, and as digital games. By leveraging as a lifestyle brand, Transformers has increased its sales revenues. Please explain the success trap. The success trap is common in every company. I will use Microsoft as an example - Windows software was its first innovation. The Company persuaded PC makers to install Windows on PCs. At the time, PC makers were on board with it because Windows powered sales of PCs. PC sales went up in the 80's and Windows-powered PCs became box 1. When you succeed in box 1, it is both good news and bad news. Good news: Microsoft was succeeding. Bad news: Success trapped Microsoft. Companies start to believe that current successes are based on what was done in the past, so companies focus on preserving the past. Microsoft focused on preserving the past: Windows powered PCs. It missed almost every big idea in the mid '90s including the internet, digital media, mobile phones and digital music. Microsoft missed these ideas because for it to pursue mobile phones, it had to accept that the sales of PCs would decline (box 1). Microsoft could not forget its success formula (PC sales) - The organization could not come to terms with a decline in PC sales. If it could have come to terms with that, it would have embraced mobile phones. Microsoft was so caught up in PCs that it missed big developments and subsequent ideas. The new leadership is remaking Microsoft around Three Box Solution. What are common traps from the past that businesses must overcome? · Competency Trap: When companies are successful, they try to recruit people that support box 1 success. When succeeding, they only add competency for box 1. · Complacency: When you're successful, you become complacent. There is no urgency for change. · Cannibalization: This is the belief that sales of current box 1 will go down if you introduce box 3/another product line. Example: The newspaper industry thought that introducing a digital platform would cause a decline in print sales. How can box 1 leaders prevent teams from being distracted from performance goals? Box 1 should focus on box 1. Box 1 should not think about box 3. Creating a separate team for box 3 allows some separation from box 1. A team can focus on box 1 and a different one can focus on box 3. Build separate teams to focus on each box. Please explain the concept of corporate ambidexterity. Ambidexterity is being able to operate with both your right and left hand. You have to be very good in box 1, 2 and 3. Box 2/3 focuses on the future and box 1 focuses on the present. Ambidextrous leaders can operate with microscope (box 1) and telescope (boxes 2 and 3). Are there any businesses the Three Box Solution could not apply to? None. It applies everywhere. Not just business, it applies to churches, universities, non-profits, countries/governments, and to personal life. The central idea in the 3 box solution is that the future is now. The future is not about what you need to do in the future; it's about what you need to do today to create the future. This interview was conducted with the help of Lancel Joseph. He has a background in marketing/ advertising, and currently works as a Technical Account Manager for a Fortune 100 company.